When you walk from outside, in, throughout your restaurant you get an outsider view. Pay close attention to details that an outsider would often spot. You have to do this with a critical eye. You must act as if it were your job to find flaws within your restaurant. Because for the inspector coming to your restaurant, it is his job. When you use the same inspection form as the health inspector to review if you’re prepared for the inspection you can better get a grasp on what they’ll be looking for, giving you a chance to improve certain areas. You can also review your past inspections, and improve on the things that needed improvement before. Posting previous inspections in the break room can help the staff see what needs to be improved upon making it a group effort to get a better inspection the next time around. 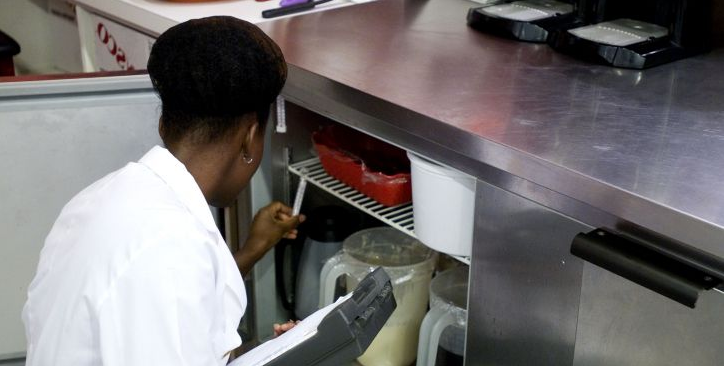 Health inspectors pay extra close attention to detail when it comes to the areas of food-borne illnesses and food allergies. Make sure your staff knows proper food handling safety to reduce any risk of food-borne illnesses and cross contamination. Weekly staff meetings will help reduce the anxiety that staff members might feel about the health inspector when they arrive. Weekly meetings will help your staff know what the health inspector is there to do and inform them of tips they may want to know before the inspector comes in. Push hand washing using signs where there are sinks and doors. Also push good food handling habits with gloves readily available and re-instruction on proper dish washing procedures.